The Torah, from the Hebrew for “learning” or “law,” contains the five books of Moses. 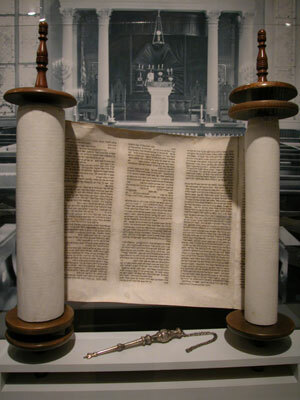 Also called the Pentateuch, the Torah is the foundation of Jewish law and practice. Yad, meaning “hand” in Hebrew, is the pointer used while reading from the Torah. A yad traditionally tapers at one end to a hand with an outstretched finger.